The picture above is the next big project I tackled and it turned out much better (except for the whole "crosses in the same direction thing". It looks a little wrinkled because I recently took it off its old mounting board (something else I needed a good lesson in doing correctly) and washed it. The dust and dirt I was trying to get out still need another soak before I remount and reframe it. I stitched this one mostly, if not entirely, during my freshman year of college. 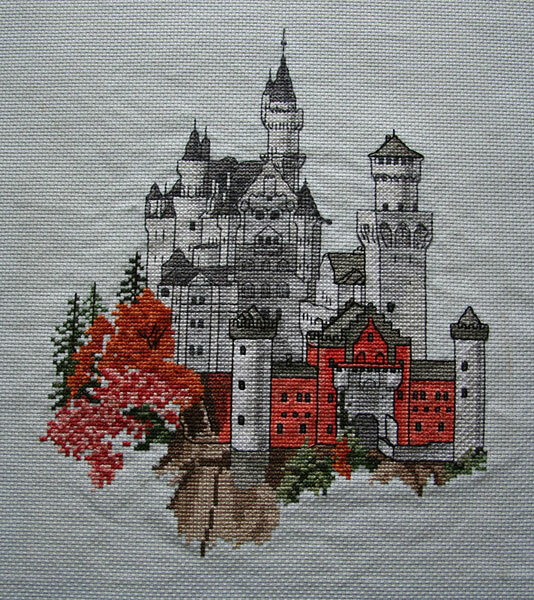 The castle is Lichtenstein, from the book Medieval Castles from Jeanette Crews Designs. I also did Neuschwanstein Castle from the same book a year or two later (which wrinkled in the photo for the same reason as the other one). 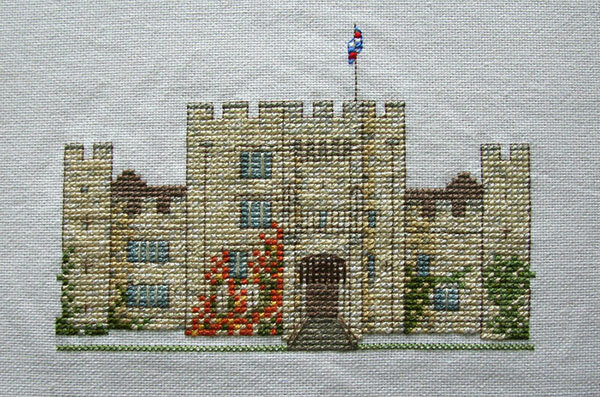 I still haven't gotten around to stitching the other two castles in the book, which is slightly ironic, considering they are British castles, which are my special love. The original book was totally destroyed, so I threw it out and bought a new copy last year, which I was pleased to see was still around about 17 years after it was first published! BTW, the other two castles are Craigievar in Scotland and Hever, in the south of England. Hever is best know for its associations with Anne Boleyn. I visited there in 1998 and bought a cross stitch kit of it there, which I stitched a few years ago (see below). It, like many others, is in one of my UFO piles... in this case, and Un-Framed-Object. As with most kits of medium and larger projects that I've stitched in the past few years, I changed out the fabric (usually 14 count aida) with a 28 count evenweave. Next time I'll post some pictures of my other frequently-stitched-objets... Christmas ornaments, along with the story of my longest unfinished objects to date. "crosses in the same direction thing"
It's been a long time since I created a cross stitch - what does the above statement of yours mean? I'm referring to my old tendency to not have all of the top stitch of the X to point in the same direction. It looks so much better and smooth when they do! ah...ok...makes sense. lovely castles and blog. such wonderful work! great art! Plan on returning again to see your work!